We had some interesting bars this month! From a wacky chocolate bar inspired by a traditional breakfast favorite to our first white chocolate bar, the July 2015 box was a quirky yet delicious collection of chocolate. …and then dashed off to work, whipped a chocolate bar together, and unleashed it upon his co-workers. Who were, naturally, impressed at first with the taste when they realized they didn’t have a clue what was in it. 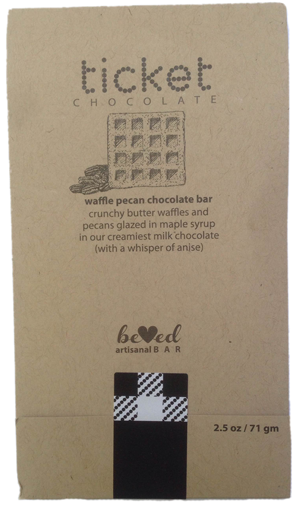 Yep, waffles and pecans were the magic ingredients to this somewhat strange, but delicious bar. Definitely a unique bar and the first time we’ve had this combination. And we tip our hat to the genius who dreamed it up. This one is actually somewhat surprising as well, mainly because the fruity flavor that you taste along with the dark chocolate is not a flavor that’s commonly mixed with chocolate. It’s not as far out of left field as Bar A was, but it’s still the first time that we’ve tasted this particular flavor in a chocolate bar. 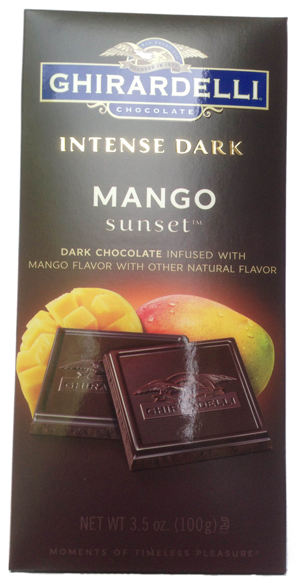 Another slightly unconventional chocolate flavor, the mango is actually an awesome complement to the dark chocolate! A surprisingly good bar here. Drumroll please…. the first white chocolate bar featured in a Mystery Chocolate Box! Over here, we have mixed feelings about white chocolate…some of us love it, and some of us feel like it’s not really chocolate. Turns out, there are two different types of white chocolate… real white chocolate and fake white chocolate (more detailed breakdown below). So while the purists over here still deny fake white chocolate a place in their hearts, real white chocolate is finding a way into acceptance. The strawberries were fairly obvious but the roses were a more obscure flavor. 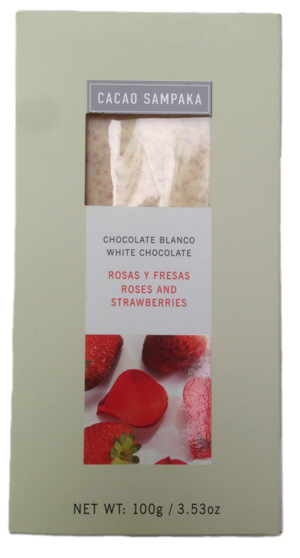 Seems like the Spaniards know their way around a white chocolate bar! (Cacao Sampaka is based out of Barcelona). This was a delicious chocolate bar and a bit of a change of of pace for us. Now, getting back to the fake white chocolate vs real white chocolate issue…. Including the first white chocolate bar in a Mystery Chocolate Box is an occasion… one that calls for an impromptu guide to white chocolate, we’d say. So we put together a brief guide to understanding the difference and, more importantly, learning how to spot an impostor. This is essential information for any chocolate lover, so pay attention. 1. Fake white chocolate. This is what you find in your low quality white chocolate bars and baking ingredients…. it’s not actually chocolate (or contains very little chocolate). It actually tastes nothing like chocolate! 2. Real white chocolate. This is what you find in high quality white chocolate bars (such as Bar C!). The reason it’s real white chocolate is because it contains a good amount of cacao butter (the only reason it’s not “regular” chocolate is because it doesn’t have any cacao solids aka cacao powder in it). It also tastes different and has a different texture than fake white chocolate, which is waxier and more oily. It’s actually pretty simple… just examine the ingredient list. In a real white chocolate bar, cacao butter will be either the first or second ingredient (and sugar will usually be the other one). Fake chocolate items will consist of mainly sugar, some kind of oil (palm kernel oil and vegetable oils are frequently used), and usually milk or buttermilk. And usually some other scary sounding ingredients. Well basically, if you want to avoid a disapproving glare from us (and the rest of the chocolate loving community), check the ingredient list and avoid fake white chocolate. It’s better for you anyway. And that’s all for the July 2015 box! We’d love to know what you thought about it — post below. No Replies to "July 2015"